5 Star Legal Support States "In the civil process service world, few jobs are more challenging than those without a physical address. And while cases in which you are given a post office box may offer slightly more information, there is a chance that they could be just as challenging as those cases without addresses." Unless service is being mailed using the USPS and certified mail, you will need to do some work to determine the physical address of the individual you need to serve. In an effort to take some of the mystery out of these serves, we’re outlining some tips for how to tackle locating and serving the individual and make these types of serves not as challenging as they appear. If only it were that easy… Although service can sometimes be effectuated using certified mail, if personal service is required, you cannot serve a Post Office box. In those cases, you would have to serve the individual named on the summons. Furthermore, you cannot serve post office workers. Not only will employees at the post office not be able to accept service for an individual holding a box at the post office, they will likely refuse. If for some reason they were to accept service, it could be deemed unacceptable, and the service could be thrown out in court. You will need to locate the physical address in order to complete or attempt personal service, or you will have to serve the individual on the street. When you’ve been given a PO Box, the order of business to tackle is to identify the physical address. Having this information will obviously put you in a better position to effectuate service. Luckily, there is a fairly easy way to obtain it given that you have all necessary information. 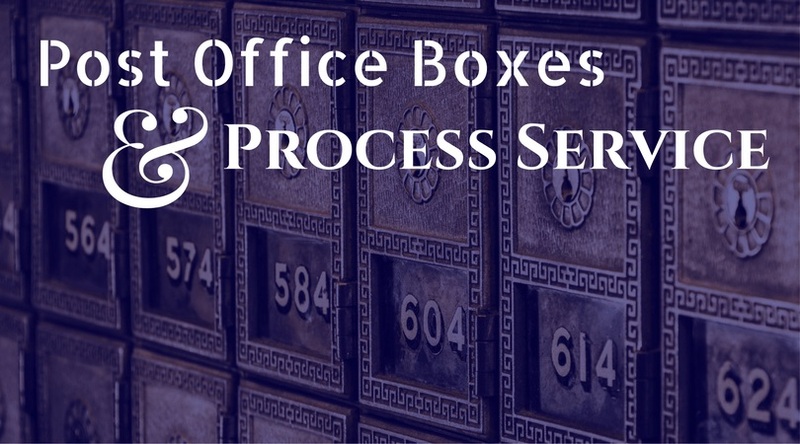 While not something that the general public can easily access, obtaining the physical address of a PO Box is a little easier for process servers. You can easily request the PO Box owner’s verified address, but it must be done in writing using the correct form. The form is available online on the USPS website. According to the USPS website, “Agencies must use the Address Information Request Format - Government Agencies in accordance with regulations at 39 CFR 265.6(d)(5)(i) & 265.6(d)(7) when requesting address verification. If the request lacks any of the required information or a proper signature, the custodian must return the request to the agency specifying the deficiency in the space marked "other".” There is also another “boxholder request” form, which is available on the United States Post Office website. Keep in mind that completing that form does not guarantee that you will be given the box holder’s information, and if you incorrectly fill out the form, the post office is not required to complete your request. In the event that you are unable to obtain the box holder’s physical address, or if the address you are given turns out to be a dead-end lead, you can utilize skip tracing services. While some civil process service companies offer skip tracing services to their clients, some companies exclusively specialize in this service, which taps into a number of resources in order to locate the current address of an individual. Depending on the company or what resources you have available, you may be able to access vehicle registration and/or utility records. And regardless of whether you use a professional skip tracer, don’t forget about various public records accessible to anyone, such as the county assessor’s office and other public records! In the event that you cannot locate the physical address of the individual to be served, keep in mind that you cannot drop or post service inside a United States Post Office. If you choose to wait for an individual to pick up his or her mail, you would need to attempt service on the actual individual. Although civil process service can have its challenges, there is certainly nothing stopping a civil process server from rising to the occasion and completing the service. Many process servers choose to require that their clients find the address of the party to be served, whereas some offer that as a value-added service. Depending on the volume of work you do, your time, and ability, choosing to handle service without having a physical address is entirely up to you and your business — just be upfront about it with your clients to maintain a positive business relationship. Does your firm accept jobs in which the client only has a PO Box? If so, how do you handle it and did we miss anything that should be included? Previous Previous post: How To Find A Good Process Server?